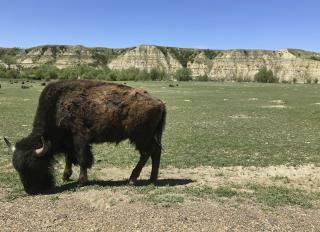 (Newser) – An Alaska man is recovering after being attacked by a bison while hiking in western North Dakota's Theodore Roosevelt National Park. Park official Eileen Andes says the 65-year-old hiker encountered the large animal on a trail after taking photos of a sunset. He tried to walk around the bison but didn't provide a wide-enough berth, reports the Minot Daily News. The bison apparently threw the man into a bush, knocking him unconscious, Andes says. When the man regained consciousness, he was bleeding from a leg laceration but made his way to the trailhead. When he saw more bison, he climbed several feet up a butte. American bison are crazy big, and remarkably nimble. They can weigh up to 3800 lbs, jump nearly 6 ft vertically, and run up to 40 mpg. They are describe as having a "wild and ungovernable temper". Eek! I'll be using zoom on my camera for those pictures at the national parks. I suppose we will have to euthanize it and dissect it some to see what its intentions were, people just can't stay away when uninvited into the animals home..
That was just a little warning from the bison.